Dubai, UAE, April 4, 2018: During the past year, we saw many brands coming up with creative products and ingredients that claim major benefits to the skin from acids to antioxidants, but if there is one ingredient that will stand out in 2018 - then it has to be Vitamin C with many beauty experts swearing by the potent effects of this ingredient and its ability to transform the skin. 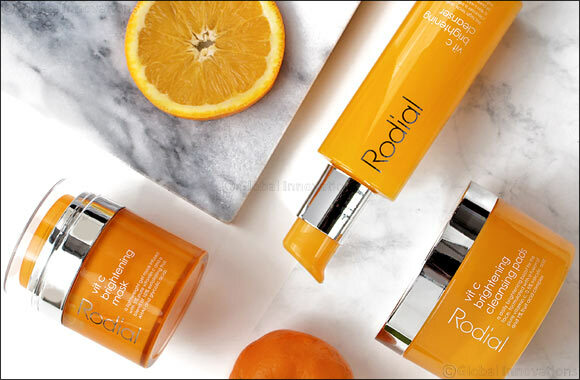 For this reason, renowned UK brand Rodial has launched its new and high performance Vitamin C range in the UAE - infused with concentrated active ingredients such as 5% Vitamin C, 10% exfoliating fruit acids and glycolic acids, as well as 0.5% salicylic acid to reveal brighter, smoother and younger looking skin. This intensive and non-abrasive daily cleanser is designed to improve skin’s texture and brighten your complexion. The cleanser uses a potent combination of Vitamin C and exfoliating fruit acids (AHAs) to deeply purify and cleanse the skin, as well as blood orange water to tighten visible pores. It also contains glycolic and lactic acids, which helps retexture and renew the surface of the skin, making the skin look younger and giving it a healthy glow. These deep cleansing pads are formulated with a fusion of pure Vitamin C and 1% fruit acid complex to gently exfoliate and retexturise the surface of the skin. These pads can also help brighten skin tone, refine pores and prevent against blemishes due to containing 0.5% Salicylic acid. Using these pads on daily basis can help improve the firmness of the skin and give it a healthy glow. This lightweight gel mask is infused with 5% pure Vitamin C and a blend of 10% exfoliating fruit acids (AHAs), which evens and resurfaces the skin. Also, this mask contains pomegranate extract – which when mixed with the rest of the ingredients can help reduce the appearance of wrinkles, age spots and protect the skin against other signs of aging. It is advised to use this mask 1-2 times a week for radiant and younger looking skin. For those who prefer the sheet mask experience, the range also includes this rejuvenating, retexturising and illuminating bio-cellulose mask. This mask includes a blend of Vitamin C, Vitamin B3, Amino acids and Hyaluronic acid to brighten dull complexion, exfoliate and revitalise the skin. It also helps hydrate the skin, reduce the appearance of wrinkles and give it a more youthful and plumped effect.